I realized only when I was reading his latest, about the Wright brothers. Wilbur and Orville, we go back a ways, too. 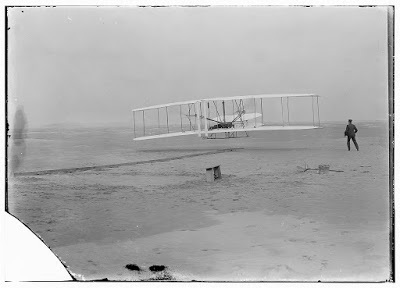 umpteenth anniversary of the first powered flight. I speak in awestruck tones about seeing the Wright Flyer at the Air and Space Museum. the life of any party. flutter was worth the while. whose protection of their patents bordered on the obsessive. horrid, except that it sounds like they had rather a happy home life. were quiet fellows who largely kept to themselves, at least until fame struck. Bolée, and the others said quietly, ‘Gentlemen, I’m going to fly.’” (p.
whom he finds pleasant and talented himself, so it’s a whirlwind of goodness. this December 17 business. Avoid me on that date. This entry was posted in Aviation, History, Nonfiction, Unruly Reader. Bookmark the permalink. I've always wanted to read a good biography about the Wright brothers. (I read all the kid books I could find about them when I was growing up. Them, and Annie Oakley.) I'll have to check this one out. 🙂 Great review! Nice review, Unruly…I have had my eye on this book…it just arrived at the county library. I've joined both the city and county libraries. Got my bases covered. Lark — this is s good one! Bybee — way to be a super-patron!